In this episode of Cooking with Carlo, we learn how to make Tuna Poke. 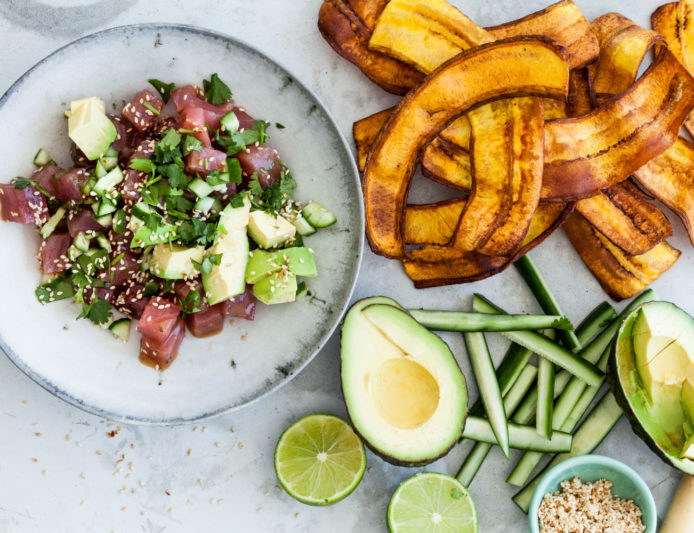 This tuna poke is a lot like tuna tartare but with all of the flavors of traditional Hawaiian poke including lots of fresh ginger. It’s an easy but very elegant first course and goes especially well with festive drinks. For a vegan version, substitute small cubes of watermelon for the tuna (and leave the honey out). Roll the tuna tightly in plastic wrap and place it in the freezer for 2 hours so that the exterior is firm, but it’s not frozen to the core. Unwrap it and use the sharpest knife you have to cut it into ½-inch cubes. Place the tuna in a large bowl and add the scallions, garlic, ginger, cucumber, cilantro, orange juice, ponzu, sesame oil, honey, chile paste, wasabi paste, and salt. Taste and season with salt if needed. Gently stir everything together and transfer it to the center of a serving dish. Top with the avocado and drizzle the avocado with the lime juice. Sprinkle the sesame seeds on top. Surround with the plantain chips for scooping. Serve immediately.